Sometimes it’s hard to be independent. I’ve mentioned in other posts that Kate is becoming increasingly dependent on me. While she is accepting and requesting my help, there are still plenty of occasions when she prefers to do things on her own. It is especially difficult for me to judge whether or not she wants help is when she is going up or down stairs or curbs. It seems like half the time she does and half the time she doesn’t. I try to handle this by standing in front of her ready to give her a hand if she wants it. If she is behind me when we approach a curb, I often hear her say, “Hand.” Then I turn and extend my hand. Just as often, I extend my hand when she hasn’t asked only to have her refuse to take it. It is similar with her clothes. Increasingly, she wants my help, but many times she doesn’t. Yesterday morning in Chapel Hill, I had put her clothes out for her. When she started to get dressed, I told her to let me know if she needed my help with anything. She wanted to do it without my help. In a few minutes, she was about to put on her pants. She had trouble determining the front from the back. That caused her to ask me to check to see that she had it right. She didn’t. She thanked me. Then she proceeded on her own. At one point, she got her foot stuck in the pants leg. She had to ask for my help. I am glad that when this happens, she doesn’t seem to be irritated with herself for not being able to take care of it by herself. On the other hand, she often makes reference to her making mistakes. She is very conscious of the problems she has handling many daily activities. I am sure that is what leads her to thank me so often for taking care of her. She is very appreciative, and that goes a long way to reinforce my desire to help. Kate has never liked being dependent on others, not even before Alzheimer’s. Of course, none of us is ever completely independent. All of us depend on others in one way or another. We generally pick and choose those things we will do for ourselves and those we would prefer for others to take car of for us. The first big blow to her independence came when she stopped driving. That was four years ago this past December after an accident in which she totaled her car. You might think that she would be used to being without a car by now. Not so. She still occasionally says, “How would you feel if you had to depend on me to take you everywhere?” That happened just today. I am reminded that her initial desire to keep her diagnosis private was largely motivated by her not wanting to be treated as a patient. She wanted to be treated like anyone else. In a way, that was an expression of her desire not to be dependent on others. There are areas where she has worked hard to assert her independence. Among those, the one that is most noteworthy involves her clothes. Within two or three years of her diagnosis she was not selecting clothes that she would have worn before her Alzheimer’s. At that point, I was new to dealing with such things and would let her know that what she was wearing was either soiled or inappropriate for a particular occasion. She often resisted my suggestions. I have learned to be more accepting, but I still intervene depending on just how soiled or inappropriate her attire. Over time we have both done some accommodating, but she has done more. That means she has become more dependent on me. This dependence has evolved and has often been her own choice and not mine. There are now times she specifically asks me to get her something to wear. This seems to occur when she has looked for something but hasn’t found anything she thought was right. It is almost as if she has been overwhelmed by the choices. There are a lot of clothes in her closet. Although I have gotten rid of many things that no longer fit, I have also added many new clothes. Whatever the cause, it is clear that she sometimes wants my help. The same thing is true about dressing. I would never have thought about helping her dress until she has struggled with getting them on. I generally ask if she needs help. Often she says she doesn’t. Other times she says she does. One other area in which she asserts her independence involves my taking her hand when we go up or down stairs or curbs. Sometimes she wants my hand. Many times she does not, and she often refuses sternly. I always do what she wants, but I try to watch her closely in these situations to see if she needs help. I see other signs that she may be working hard to maintain a sense of independence. For example, she is more careful now than three or four years ago when it comes to maintaining a measure of order with her clothes. She no longer lets her clothes accumulate on the furniture and floor of the bedrooms. In addition, she is trying to make up our bed each morning. It’s not done quite the way she would have done it before her Alzheimer’s, but it is immeasurably better than in the past few years. As time has passed, she has become increasingly unsure of what she should do and depends on me to guide her. This almost never involves what she should wear. It does involve things like “Should I get ready for bed?” “Should I go to bed now?” or “Should I take my cup into the restaurant?” It also includes some things for which I would never think she needs my guidance or permission. These include things like “May I use my iPad?” and “May I take my shoes off?” All of these questions are usually asked via hand signals rather than spoken words. The latter two questions occurred just a few minutes ago. I took a break to take a shower. Before I did, Kate said she was going to bed. Then she said, “What should I wear?” I said, “Would you like me to get you something?” She said yes. In this particular case, I know she is tired and believes it is simply easier for me to get something for her than to do it herself. In other words, this is a time when she would rather be dependent. She is working hard to retain independence related to things which she believes she can do and wants to do. This is not really any different than what each one of us does. We pick and choose, but we don’t want to feel dependent. That raises a related question. How we feel about these changes? I must confess that I really don’t know how she feels. Since she doesn’t like to discuss her Alzheimer’s and its consequences, I can only infer from what I observe. That said, I believe the change to greater dependency is more difficult for her than for me. I say that for two reasons. First, she reacts so strongly when I attempt to help her with something that she feels she can and wants to do for herself. Second, I imagine that if I were the one giving up my independence in the same way, I would hate it. As for me, her becoming more dependent actually makes it easier for me to take care of her. There is less hassle when I am in control. On the other hand, I don’t like seeing her becoming more dependent. It makes me sad each time I recognize that she has crossed another marker on her journey. 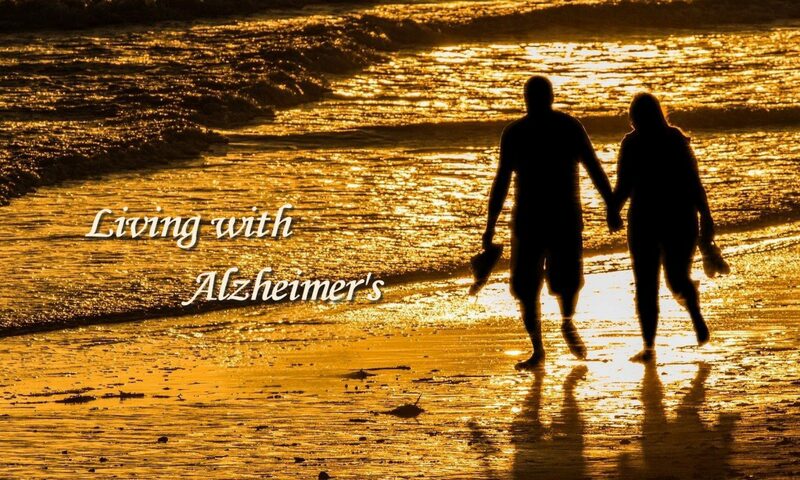 I would much rather deal with the stresses of caregiving than experience the sadness that accompanies Alzheimer’s. Losing one’s spouse is really losing a part of oneself. Next month we will celebrate our 55th wedding anniversary. We were so innocent as we faced the future together. Like other couples we were wildly enthusiastic about the future; however, we couldn’t begin to imagine the abundance of joy and good fortune that lay ahead. I am satisfied that we have invested wisely in the time we have had together and confident that, together, we will weather the storm that awaits us. When you run into a problem, you use whatever skills you have to solve it. Kate and I stopped for lunch before our visit with Ellen. Shortly before we left the restaurant, she went to the restroom. Knowing she wouldn’t remember where we were sitting, I kept watching for her to come out. As I might have expected, she took a wrong turn to get back to our table. I saw her approach the entrance to the kitchen and thought she was going to ask for help. I got up from our table and walked toward her. She was talking with one of the employees. Before I reached them, they had turned and started walking back to the restroom. Kate saw me and said she would be right back. I returned to the table and waited. All the while, I was wondering what had happened in the ladies room. I thought perhaps something wasn’t working or that Kate might have broken something. In a few minutes, Kate and the employee walked over to me. Kate said, “She is going to tell you something that I want to remember.” The employee told me that Kate had seen a quote by Eleanor Roosevelt that said, “A woman is like a tea bag – you can’t tell how strong she is until you put her in hot water.” Kate just beamed and said, “Isn’t that a great quote. Now make sure you remember that.” Kate thanked the employee and asked her to say it one more time. As we walked out I saw the employee and went over to thank her myself and let her know about Kate. She was a very compassionate woman and had already guessed. Kate walked over and gave her a hug. It was one of those moments that hit me once in a while. Tears instantly welled up in my eyes, and we said goodbye. As we continued our drive to Ellen’s, I thought more about Kate’s predicament. She saw the quote and must have read it several times. She wanted to remember it, but finally had to recognize that she couldn’t. She knew she couldn’t take me into the ladies room to read it and remember it. What does one do when caught like this? If its really important, you have to ask for help. She did just that, and she hit the jackpot. She found a caring person who was not just willing to help but to do so in such a sensitive manner. I am also reminded of John Zeisel’s book, I’m Still Here. He makes the point that although the person with dementia may lose some abilities, they retain others for a long time. Kate is well into her journey. It’s over seven years since the diagnosis. By my own judgment, she is well into Stage 6 of the seven-stage model. Nonetheless, she retains amazing skills in casual social interactions. She has amazing insights about me and many social situations. In addition, she works hard to solve problems that would not have been problems before Alzheimer’s, like putting clothes on. It’s a challenge to distinguish the front and back of most of the tops she wears. Often when I start to help her, she stops me. She wants to do it herself. The saddest thing of all is when she has to give in and ask me for help. I’m beginning to think more about Eleanor Roosevelt’s quote about women and tea bags. Kate is in “hot water,” and she’s showing just how strong she is. Over the course of Kate’s illness, she has relied on me for many things. The number of different things has gradually increased. At first, it was principally as a source of transportation. Over time she has come to depend on me to organize our lives, our daily routines, take care of routine household chores, and most aspects of her life. She has always looked to me to answer questions for which she didn’t know or couldn’t remember the answers. Recently, however, she is asking me more questions. It’s not just that she is asking more. It’s the kind of questions she is asking. They are questions that clearly signal a new stage in her journey. They are asked innocently as though they are the kinds of questions that almost anyone might ask. Another way of expressing this is to say that she displays no effort to disguise the fact that she can’t remember many things. The questions I have in mind are mostly those about other people. She has much greater difficulty remembering most people’s names, now. That includes close family members. I have found this particularly noticeable during the past three months when we have made two different trips to Texas. She has continually asked me to tell her the names of people like her close childhood friends. That is not too surprising since she rarely sees these people, but it includes longtime friends we keep up with in Nashville. Of greater concern is the increasing moments when she can’t recall the names of our children, Jesse and Kevin. Fortunately, when she is with them, it is obvious that she remembers them and is able to act naturally with them. It is particularly hard (almost impossible) for her to remember the names of their spouses and the grandchildren. The greatest surprise of all occurred yesterday when she asked, “What is my name?” Before I could tell her, she said, “Kate.” Her questions are not limited to names. She frequently asks how long we have been married and how old she is. She never remembers. I can never know exactly what is going on inside her brain, but I do often speculate about what she is thinking or what motivates her to do things. With respect to the questions, it seems to me that she realizes she can’t recall basic things that she should know and is trying her best to teach herself by asking me over and over. Unlike the way she responded during the earlier stages of her illness, she does not express much frustration over not remembering things. She does say things like “I’ve asked you that before. I don’t know why I can’t remember.” The tone of her voice suggests a minor sense of frustration, but it is nothing like she experienced several years ago. When she says things like this, I always respond the same way with something like “It’s funny how the brain works or doesn’t work. Sometimes I will forget a name, and then, a little later, it pops into my head.” I have chosen not to tell her that this is a result of her Alzheimer’s. I see no benefit in that. I envy those who seem to be able to recall the exact words of conversations. It is just about impossible for me. In this journal, I have tried to capture exact quote where I can. In many case, I have retained the spirit of the words that Kate and I have spoken, but they aren’t always the same exact words we have uttered. The notable exception is the mention of phrases that are common place like “Let’s not talk about it” or “Tell me tomorrow.” All of this is to say that we just had an exchange that I wish I could capture in the literal words in which they were spoken. Here’s what happened. As we walked out of Panera to return home, the sun was shining brightly. Kate put her hand up to protect her eyes. I said, “This is a good day for sunglasses.” Then I remembered that she had lost the two pair of sunglasses I had bought her recently. As it turned out, I found one hanging on a shrub the other day. After returning it to her, one of the lenses fell out. I told Kate I would have to see about getting her new ones. When we got in the car, she said, “If I had a car, I could get my own.” Then she mentioned other things she could do if she had a car. I told her I knew that she missed having a car. We exchanged a few comments about my willingness to take her places. Then she said, “How would you feel if you were the one without a car, and I had to take you everywhere. ?” I told her I wouldn’t like and would feel dependent. As I continued to talk, she said, “I’m not listening.” It wasn’t mean-spirited, but I knew it was clear that she wanted me to stop. What I think is significant is that Kate does not talk much at all about how she is feeling. Much of what I know about her feelings I pick up from observation. This particular conversation is an indication of her continued struggle to hold on to her independence. This goes far beyond having a car, but it seems like the car is an obvious symbol of her dependence. I should not be surprised at this. I do recognize that having the freedom that a car provides is very important for many of us who are aging. Kate had a couple of muffins and orange juice that I brought to the room this morning. Then she took and shower and dressed for the day. Because I have learned on past trips that she doesn’t know where she is when she gets up, I made a point of telling her we were at the Residence Inn in Nashville and that we would be having lunch with her cousin. After getting dressed, she said, “What now?” I told her that her cousin would be coming to get us in a little over an hour and that we had time to relax on our own until then. Then I asked if she would like to go to the hotel lobby or to Starbucks. She wanted to go to Starbucks. It is almost across the street; so we walked. As we were walking, she said, “Ask me where we are staying.” I was surprised as she had never done this before. She proudly answered “Haywood Park.” I smiled but said nothing. That is the hotel we stay in while we are in Asheville. We have stayed there many times since 2002, three times Since Memorial Day this past May. As I have mentioned on a couple of occasions, perhaps more, I have noticed that Kate is looking to me to take charge of things she had controlled in the past. Specifically, I have commented on her willingness (though reluctantly) to receive and even ask for my help finding the right clothes to wear. There are a couple of recent things that I have not made a point of. Yesterday evening, for example, when we drove into the garage from dinner, she asked in the style of a little child, “Can I go around to the side of the house and work for a little while?” I told her I would be happy for her to do that. These things are especially striking to me since she is also more frequently commenting on how much I want to control her life. She occasionally refers to me as “Master” in a derogatory sense. And despite the fact that I am constantly thinking of the things that will make her happy or not in an effort to keep her upbeat, she occasionally remarks that “You don’t think of me. If you were the one who is hot, you would see that the air conditioner (in the car) is on right away.” I take these things as part of the transition to a period of greater dependence on me. This is something to which I do not look forward. I treasure the fact that we have been able to enjoy ourselves so much since her diagnosis. I will always be grateful for this time. I would also like to postpone as long as possible the stages that remain ahead. Change is gradual and impossible to detect from day to day. On the whole, however, I would say that Kate has exhibited a number of changes in behavior. I take all of them as signs of her continued decline and drift away from me. I have noted her desire for independence a number of times. This is pretty strong and I believe the result of my trying to help her so much. She has become resentful of that and tells me that I don’t think she can do anything on her own. She is not far off base on this judgment. She makes so many mistakes that I find myself trying to head them off. She even resists taking my hand as we cross streets or go down stairs. I have offered numerous times to help her clean up the clothes in the three bedrooms. She won’t hear of it. She says she is working on it. In fact, recently she has been doing so. This past week I had planned for us to go to Panera during the morning while our housekeeper cleaned. She wanted to do so, but she started cleaning her office; so I let her do that. She was getting some satisfaction from doing it, and it really needs to be done. She works very slowly; so she didn’t get far. Then she messes up faster than she is able to clean up. She is washing clothes more regularly, something else that I believe arises from her desire to be independent. It also comes, I think, from her not be able to do so many things that she gravitates to those things she is able to do. I have commented on her developing a sense of humor. She hits me pretty hard for being so compulsive. Sometimes the way she says things doesn’t sound humorous at all. I am wondering if she isn’t moving toward being irritable. I hope not. It is much easier to take when I think she is teasing me. This is something I may say something about, but I don’t want to make her angry or try to get her in a conversation she is not equipped to handle. This is very delicate. As I begin to look at all the things going on, I am more convinced that 2015 is not going to be a good year for us. I have talked to more people about her AD in the past few months, and I have been writing more in this journal during January than I have done in quite a while. That may signal something about me as well as about Kate. I am going through more frustration, sadness, and possibly fear of the future. I am in the midst of planning our trip to Switzerland in May and am wondering about modifying my plans to make things even more leisurely than I had originally planned. Rushing her is the worst thing I can do. Let me also make a note about her expressions of appreciation. At the same time her irritability seems to be increasing, she is also expressing more appreciation. She frequently says, “You take such good care of me.” I believe she is truly sensing her decline and recognizes how much she needs me even as she is fighting for her independence. At any rate, I much prefer the appreciation than the irritability. We are sitting here in front of the fire. I have the Cowboys-Packers playoff game on. About 10 minutes ago, I showed Kate a video that a friend had posted on Facebook. It shows a cruise ship in rough seas. The first part of the video was taken from a helicopter or plane of the ship bobbing up and down as well as left and right. The second part of the video was shot from a camera in a dining or lounge. The latter video shows people, tables, chairs, and other non-fixed equipment sliding from one side of the room to the other and back again. It is staggering to watch. It would certainly reinforce any fears of cruising that anyone might have. Kate started to put the iPad down after the first part, and I told her to keep watching. She never said a word. When the video was over, I asked if she understood what was happening. She said no. I then explained. Then she understood. I then said, “I should have given you the explanation before just asking you to watch it.” She gave me a glaring look and nod of agreement. This is a common occurrence when I am telling her something. The difference is that in most instances where I have not given a proper setup it is usually harder to understand than this video. This is a very clear video of exactly what it is. The fact that she did not understand explains why she does not react or understand so many other things in conversation or on TV or in movies. She is further along that even I fully realize. This brings to mind another clothing issue that came up before our going to lunch. When I arrived home from Sunday school (she didn’t want to go to church again today), she had not dressed to go out. She told me she was trying to find something to wear. Thinking about the 5 pair of slacks we had just bought on Thursday and the turtleneck sweaters she has still not worn, I asked if she would like me to help. She told me no and to “leave me alone.” I said “you really don’t want my help. You want to do it yourself.” She replied with an emphatic, “Yes.” When she came out to the family room for us to leave, she was wearing old clothes. There was nothing wrong with what she was wearing, but I fear that she has no idea where the 5 pair of slacks are located.